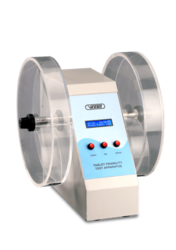 Leading Manufacturer of digital tablet friability test apparatus from Chennai. Designed with a 10 Degree tilt feature. Supports standard drum and abrasion drum. Incorporated with the powerful sturdy motor. Programmable Modes: Timer or Rotation. Designed with a 10 Degree tilt feature, used when the shape or size causes irregular tumbling. The two acrylic drums having a slot positioned to automatically discharge the tablets. Provides connectivity to balance via RS 232 interface to weigh the tablets. Advanced micro-controller circuitry and user friendly software. Alpha Numeric Splash proof keyboard for entries like sample name, batch number for data authentication. The drums have a slot positioned to automatically discharge the tablets into the ma gnetic trays, at the end of the test without dismantling the drum assembly. Total number of drum revolutions can be set in the range of 1 to 9999. Report printout complies with GLP specifications. Error message to trace out the problem. 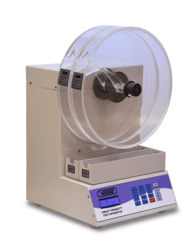 Instrument complies with USP, BP, and IP specifications. Instrument will tilt 10 Degree as per specification. It supports regular friability drum & abrasion drum. Calculation mode for friability percentage will be indicated on the display as well as print. Balance interface for sample weight transfer. For Test report: Parallel port. Looking for Digital Tablet ?